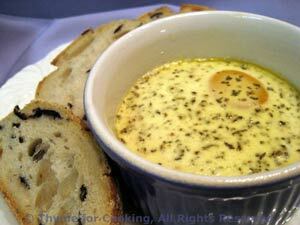 Baked Eggs with Mustard Cream, Thyme for Cooking healthy gourmet. A simple dish: eggs baked with a light cream and mustard sauce. Have some crusty bread on hand for dipping. Divide butter and thoroughly butter 2 ramekins. Mix the mustard, crème fraiche, milk and chives. Put 1 tbs of mixture into the bottom of each ramekin. Put the egg on top of the sauce in each ramekin. Divide the remainder of the sauce and spoon on top of each egg. Bake at 375F (190)C, 10 - 12 minutes, depending on how you want the yolks. Remove and serve directly from the ramekins.